I got a call the other day from Mary Ishimoto, a long-time friend of Marion and me. Mary said her dad, Rits Takeuchi, was turning 100 at the end of the year, and her family thought that because he and his wife recently became great-great-grandparents to a Gosei little girl, it would make a good story. She comes third in a family of one boy (the eldest) and nine girls. Mary’s husband, Taro, picked me up last Wednesday and drove us to Rits’ home in Sylmar (in the north San Fernando Valley). In front of the home, neatly shielded from view from the street, were a variety of mechanical items, including a lot of car parts. Unfortunately, his wife, Ida, was in the hospital. Ida is 97. We found Rits (Ritsuo) sitting erect in the middle of a couch in the living room. Mary says that until recently, he drove. He was pleasant, speaking freely, and very aware of everything happening around him. Rits was born in Pacoima, in the northeast part of the valley, just south of San Fernando and north of Burbank. When his family faced incarceration, Rits waited until the final day of removal to Manzanar before fleeing to be with his three brothers and other relatives who were farmers in Kingsburg in the San Joaquin Valley, believing the government’s assurance that he would not have to go to camp from there. 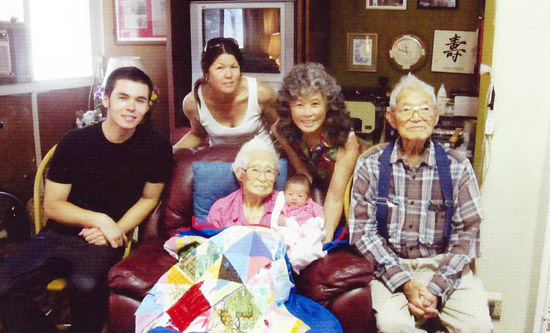 Nicholas Valenzuela, dad; Michi Ida Takeuchi, great-great-grandma; Liliana Valenzuela; and Rits Takeuchi, great-great-grandpa. Standing in center, Kelly Valenzuela, grandmother, and to her left, Mae Nawrocki, great-grandmother. When the government changed its mind and declared everyone in California was to go to camp, Rits and his five children were sent to Gila, Arizona. He pleaded with the government to be allowed to remain back with his wife, who was unable to travel, having just given birth to their sixth child, but to no avail. He was to care for his family until his wife and newborn joined the family in Gila. After camp, most of the family returned to the valley. Before the war, Rits had a trucking business, transporting produce from some of the small farms to the market in LA. Upon arriving back to the valley, a sympathetic German American man gave him a job in a lumberyard. Rits then learned carpentry and spent the rest of his career as a carpenter. A few years ago, community activist Nancy Takayama, in connection with a project started at Cal State Northridge that dealt with recording the history of the San Fernando Valley, interviewed Rits. As could be expected, Rits knew a whole lot about the subject going way back, and I sat in awe listening to him. We talked about people we both knew who came from Tottori-ken. My mother’s stepfather, Tatsuhiko Miyamoto, had roots in Tottori-ken. He graduated from San Fernando High and became a medical doctor. 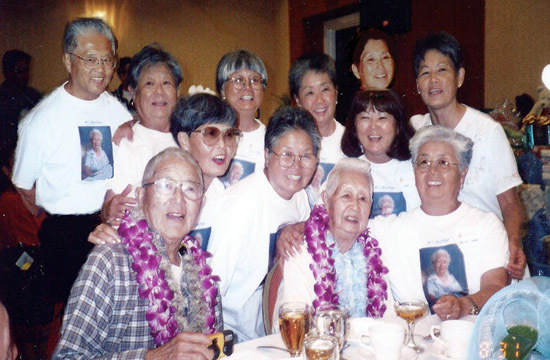 Standing — Don Takeuchi, Iris Hiroshima, Bette Anderson, Alice Kim, Pat McBain, and Mae Nawrocki; middle row — Kay Ruchholtz, Janice Takamoto, Dale Miura and Mary Ishimoto; with leis — Rits and Ida Takeuchi. This photo was taken on Ida’s 88th birthday. Dr. Miyamoto’s nephew, Ken, sometimes babysat me as a 4-year-old. He was a blustery but good hearted guy who says I used to drive him crazy, forever asking questions. I distinctly remember sitting next to Ken on his farm in San Fernando, as I did my best to help him pull carrots out of the ground. Rits knew the Miyamotos and even remembered the location of the farm on Osborne Street. When his father died in 1927, his mother took Rits and his two brothers to Japan. While he was there, his education was interrupted and when he returned after two years, Rits entered elementary school two years behind. It was in elementary school he was to meet his future wife, Ida. While attending San Fernando High, he played football and was on the track team. He competed as a broad-jumper in a city track meet against actor Alan Ladd. Ladd managed to edge Rits out by one inch for fourth place, but Rits was pleased that Ladd was good enough to console him after the event. 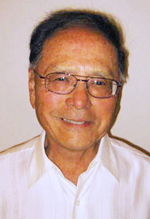 Nine years ago, when he turned 91 and his brother-in-law, Tom Imai, turned 90, Rits was interviewed by a local newspaper and he told of his football career at San Fernando High. “The coach used me for a tackle dummy for two years,” he said. The coach’s efforts to discourage the 5’6”,146-pound player from coming out for the team didn’t work. In his senior year, Rits became the wing back for the varsity team. Rits has always been a car buff. We spoke of car racing and because my stepfather, Tunney, was active in racing hot rods before the war and track racers after the war, we shared stories about this. We remembered race drivers like Yam Oka, who ran a garage in Glendale and was big in racing before and after the war. Rits will be 100 years old in December, and is sharp as a tack. It was a lot of fun talking to him. An addendum: I am saddened to report that Ida Takeuchi did not survive her stay in the hospital. She died, peacefully, the morning of Sept. 10.